The boards of Boscombe Pier made for comfortable walking. I could not really put my finger on why exactly, but piers are made for walking on and I enjoyed walking on Boscombe Pier. 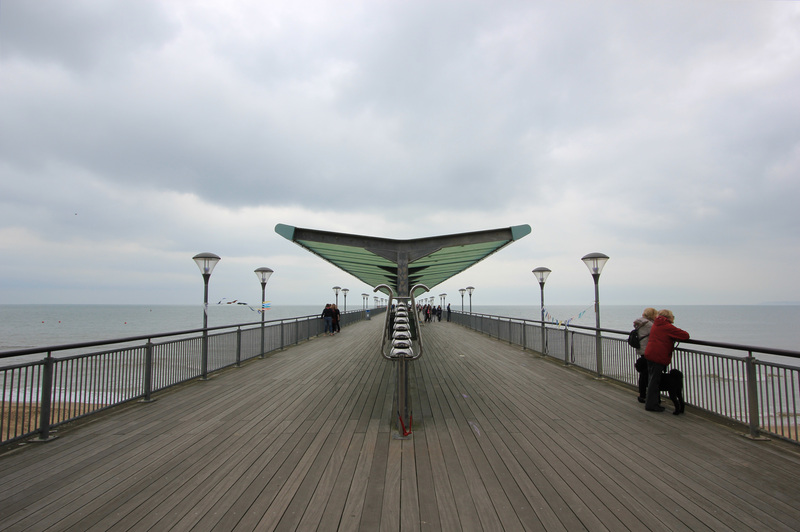 And whilst it is true to say that most piers are symmetrical in shape, I especially enjoyed the symmetry of this pier. The central shelter of Boscombe Pier is lined with information boards describing the history of the area. There is an interesting story about a whale. In 1897 a whale strayed too close to the shore and was run over by a steamer. 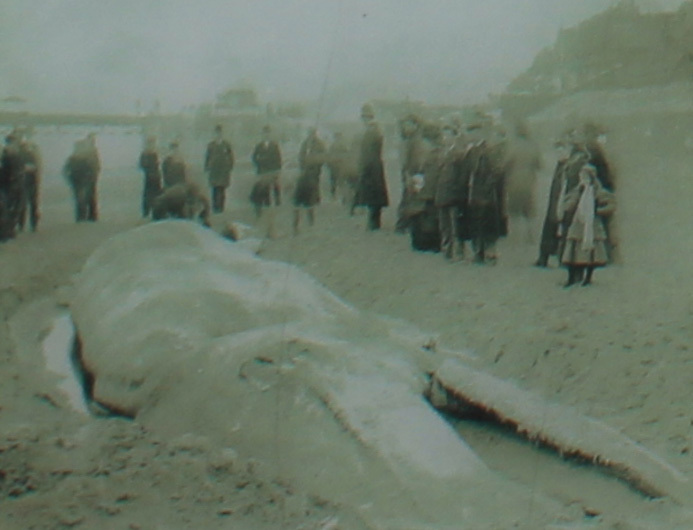 The whale suffered a broken back, died, and was washed up on Boscombe beach. It was 70 feet long, weighed over 40 tonnes, and came to present a bit of a problem to the authorities. At first, it drew excited crowds. Schoolmasters brought their classes down to give lectures. Later, in the evening, the children would come back to climb over its carcass and use its slippery skin as a slide. Their parents must have dispaired at the smell of them when they got back home. The whale was annexed by the Coastguard on behalf of Her Majesty’s Receiver of Wrecks (even today, any whale washed ashore is deemed the property of the Crown). The Coastguard decided the best thing to do was auction it off. Three days later a crowd of 500 people turned up to see it sold to a Dr Spencer Simpson for £27. Dr Simpson declared he was going to strip the whale of its flesh, boil the skeleton and turn a profit by putting it on display and giving lectures. He wrote a cheque out, duly addressed to the Queen, and got started. Stripping a whale of its flesh and boiling its skeleton is no small undertaking (I once found a sheep skull in the hills of Ingleborough, took it home and boiled it clean, so I have a small notion of the amount of work involved). 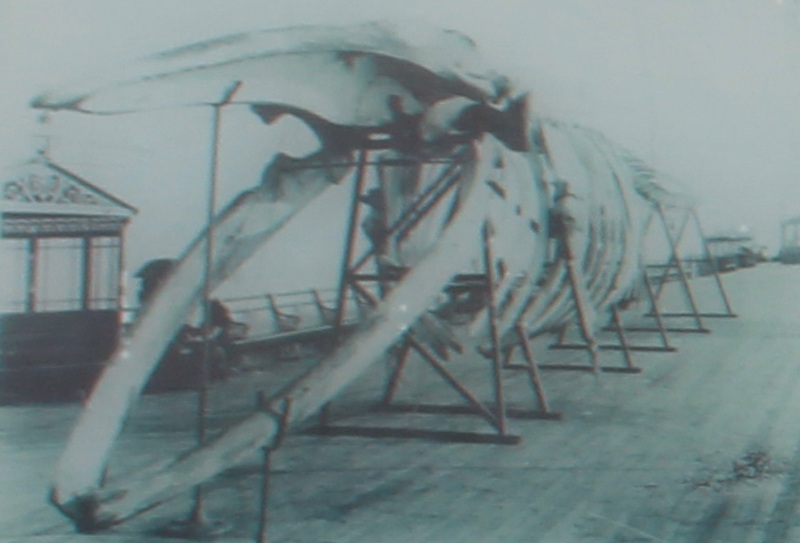 Anyway, Dr Spencer also discovered it was quite a lot of work, and he had a whole whale to deal with. He enlisted local workmen to assist him. In the meantime, whilst the carcass proved to be a popular tourist attraction, it slowly began to decompose. One man travelled all the way from Somerset to see it. He walked around it and then climbed on top of it. Asked what he was going to do by climbing on top, he replied, “Do? I’ve come forty mile to see this ‘ere whale, and I’m going to walk on him from his head to his tail”. This he tried to do, but he sunk into the decaying flesh and had to be pulled out by onlookers. I wonder if he got a change of clothes before travelling the forty miles back home? As the whale decayed it also began to smell. Worse and worse the stench became as the carcass slowly seeped and sank into the sand. The workmen sprayed it with disinfectant, but the Council lost patience at such a large and insanitary pile of rotting flesh (Boscombe’s origins were a spa town, you must remember). The Council sent their chief sanitary inspector out with men and carts so as to remove the body. They were met by Dr Simpson who also had the backing of the coastguard, and so the chief sanitary inspector with his men and carts had to leave again. Not to be deterred, the chief sanitary inspector returned five days later with more men and bigger carts. A fight broke out, and Dr Simpson drew a sword-stick, threatening to run the chief sanitary inspector through with it! He was promptly arrested and charged with assault! 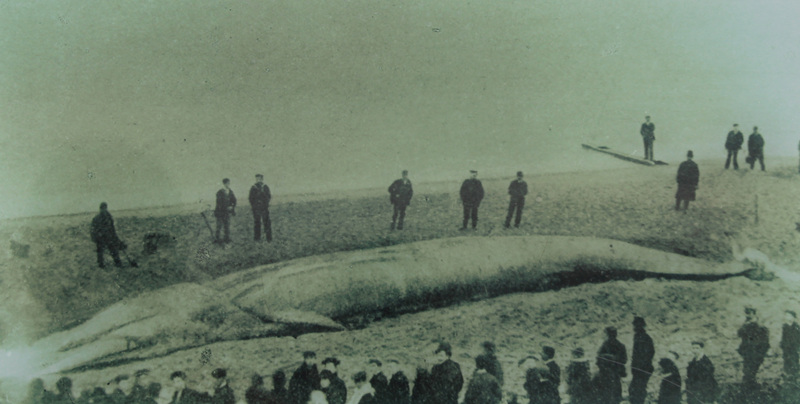 The whale was dismantled and most of the blubber dumped off Brownsea Island. Dr Simpson managed to get some of it to Poole where he intended to auction it off. This auction was not a success; Dr Simpson spent £135 transporting it only to find that nobody turned up to bid. Eventually, after 45 minutes, some curious seafarers arrived, and a short while later the blubber was sold for five shillings. As for the skeleton, it was eventually displayed on the pier. It lasted until 1904 when it was dismantled; it is now lost in the swirling, stinking mists of time. My sheep skull, on the other hand, sits on my mantlepiece to this day and gazes at me unblinkingly as I write my blog posts, smiling at me with its toothy grin. This entry was posted in Dorset and tagged Boscombe, carcass, coast, Dorset, pier, travel, walking, whale. Bookmark the permalink. It’s great to discover a good pier with a proper, long walkway. (So many of them are cluttered with amusement arcades and tacky shops.) Loved reading the account of the stinky whale 🙂 Dr Simpson was clearly bonkers! The world needs a few bonkers people to keep it sane I always say!